Two years on, and what better way to mark this auspicious day by mentioning some really thrilling news...! The magazine editor Michelle asked if we had an alternative photo of the cushion that they could use and as we are literally minutes away from the Bay we thought it might make a good setting, better light, interesting textures... However it's been very autumnal here and every time we planned to take the shots it was either rainy, windy, gloomy or high tide! 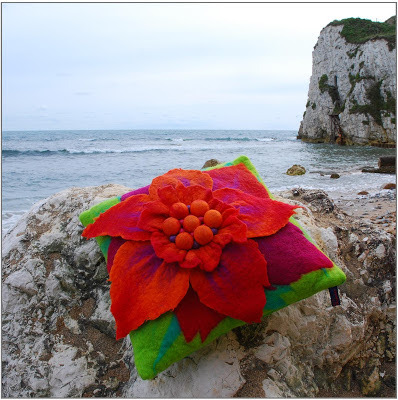 The slightest breeze causes the felt to move resulting in that fuzzy out of focus look, but KC took this lucky shot and it will be featured in the magazine along with all the step-by-step instructions to make the cushion. FELT magazine has such a wide following across the world, with contributions by many internationally respected felt makers all sharing their expertise, so I feel very honoured to be included. And it's a such marvellous way to mark this anniversary! The other piece of exciting news is the launch of my new "Felt Jewellery" kits. Many people have suggested I made them available especially with Christmas coming up as they will make ideal gifts! 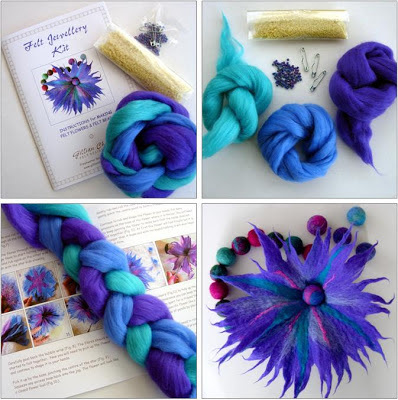 Each kit contains enough Merino fibre to make a couple of felt flowers or plenty of felt beads for necklaces and bracelets, plus soap, beads for decoration and brooch pins. The simple techniques have been tried & tested in my workshops and the kit contains a 8-page leaflet with full step-by-step instructions and photographs. Making small items of jewellery is a perfect introduction to felting and is great fun for all ages and abilities. The Dimbola Christmas Fair is this Saturday 3rd & Sunday 4th November, open each day from 10am - 4.30pm. There is FREE admission which includes entry to the Museum & Photographic Galleries, so you can browse amongst the craft stalls and enjoy the permanent photographic exhibitions and displays. The tea rooms also offer wonderful lunches & home-made cakes.